All lemon bars are NOT created equal. If you’re here looking for the secret to the best lemon bars, you’ve come to the right place. 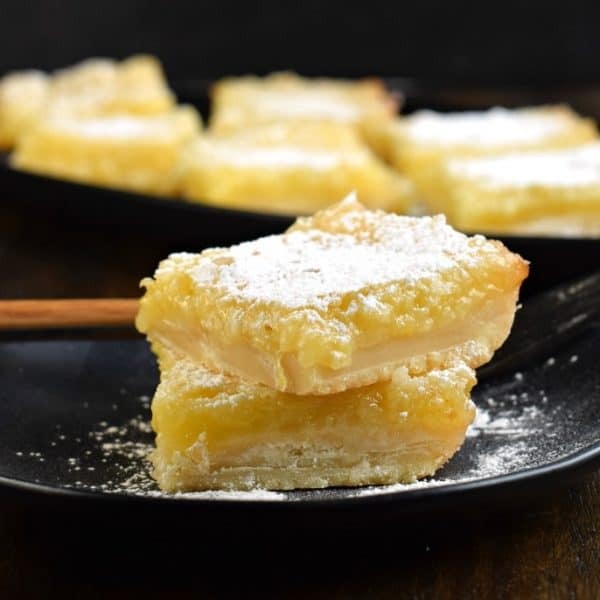 For years I have tried DOZENS of lemon bar recipes, and they all vary in consistency and taste, tart, sweetness, moisture and dryness. What I love most about a lemon bar, is a buttery shortbread crust with a sweet, tart lemon topping. I’m open to glazes and powdered sugar. Today’s recipe has been made in my kitchen at least a dozen times over the past year. I’m finally getting around to sharing it. Why did I wait? Well, every time I attempted to take pictures they turned out so bad. Apparently I’m not good at photographing lemon bars. Even today’s pictures are blah….but since I use my own website as a recipe box, it was time to document my favorite recipe for lemon bars! This recipe came from Leigh Anne over at Your Home Based Mom. She says it’s been in her family for 50 years, and I can see why!! It’s amazing. What makes it amazing? Let’s break it down! Start by lining an 8 x 8 inch (or 9″ square pan) with foil or parchment paper. Set aside. In a large mixing bowl, cut together the cold butter, all-purpose flour, and powdered sugar. Mixture may be crumbly. Press into bottom of prepared baking dish. Bake crust in oven for about 15 minutes. While crust is baking, make the lemon filling. Combine granulated sugar, flour, baking powder, eggs, lemon juice, and lemon zest. Remove crust from oven and immediately pour mixture over the baked crust. Return baking pan to oven for an additional 20 minutes, or until edges are golden brown. Remove bars from oven. To make glaze, whisk together powdered sugar with lemon juice. Drizzle over warm bars. Cool completely then refrigerate for about 2 hours. When chilled, remove from pan by lifting the foil (or parchment) and cut into squares. Sprinkle with powdered sugar and enjoy! If you’re looking for some of the best, flavorful, crowd-pleasing lemon desserts, I’ve got you covered. Lemon Cheesecake Bars top the list of favorite lemon treats. 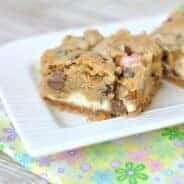 With layers of cookie crust, lemon cheesecake and lemon cookie bars this is one of the most delicious desserts ever, you won’t be able to stop eating these! Lemon Hand Pies: flaky, baked hand pies with a sweet lemon filling! Don’t forget the dusting of powdered sugar on top! Chill your lemon bars. 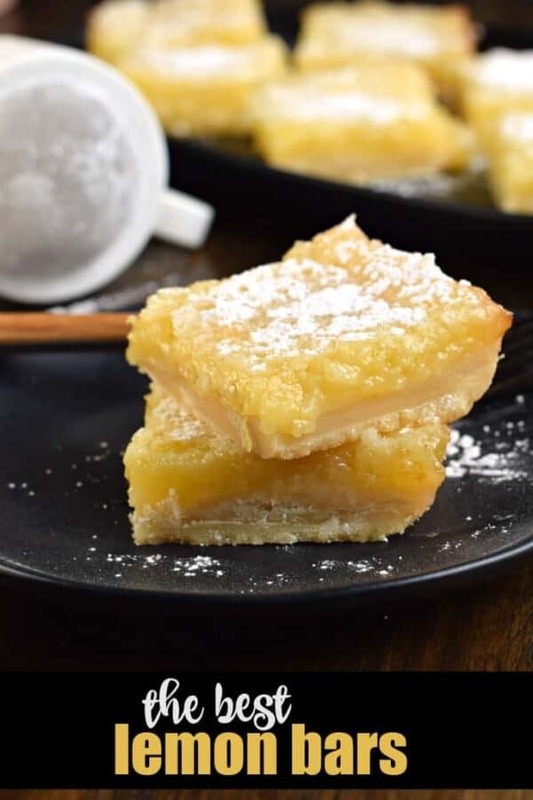 For best results, lemon bars have an enhanced lemon flavor when chilled, plus it let’s them firm up some so they are easier to cut. Speaking of cutting, the filling in lemon bars can be a little finicky when cutting. If you want PERFECT lemon squares, pop the bars in the freezer for half an hour before slicing. Help! My powdered sugar has absorbed into my lemon bars. No fear. This happens. First, wait until the bars have cooled and chilled before adding your powdered sugar. It’s best to sprinkle generously right before serving. But, if it absorbs again, just add more powdered sugar, you can’t go wrong! If you're looking for the best Lemon Bars recipe, this one is it. Buttery shortbread crust with a sweet and tangy lemon filling! Line an 8 x 8 inch (or 9" square pan) with foil or parchment paper. Set aside. 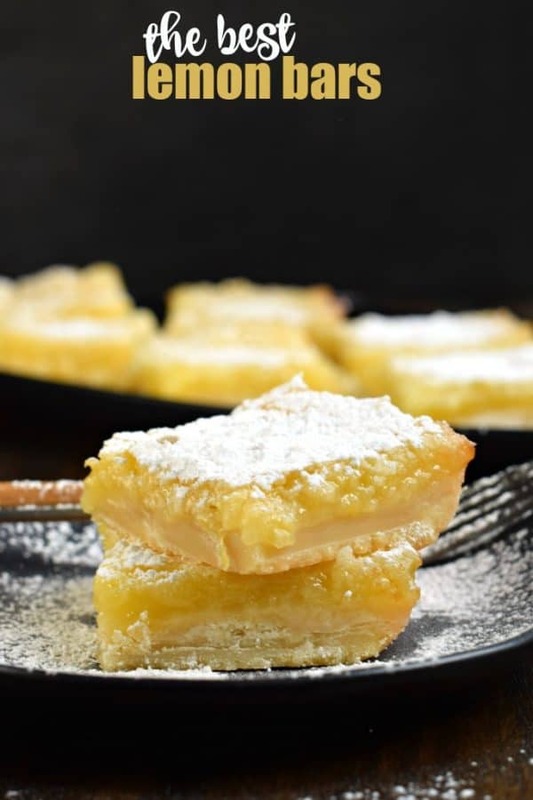 Lemon bars are one of my favorites and these look like perfection! 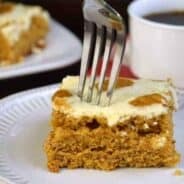 This is my favorite Dessert, thank you for sharing! 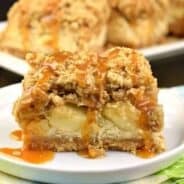 Can this recipe be easily doubled for a 9×13 pan? I have been craving all the lemon lately and these totally hit the spot! I am over here drooling over these amazing looking Lemon Bars. I am sure they taste as good as they look. These are my absolute favorite! You are spot on about chilling them first. So much easier to cut! 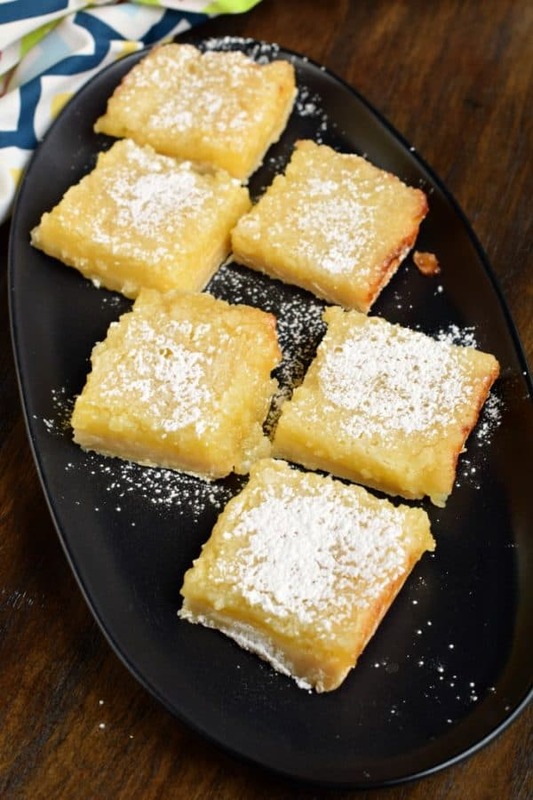 These are the best lemon bars ever! So delicious! I am assuming that the 1/4 powdered sugar for the crust is 1/4 cup. Is this correct? How do they freeze I wonder. They get a little soft and gooey in the freezer. It’s possible, but they don’t have the best texture after thawing,. 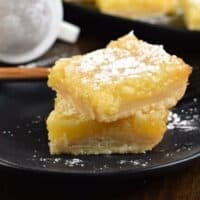 These truly are the best lemon bars! Perfectly sweet and tart at the same time! I highly recommend.